Since your substrate is one of the most important parts of your crabitat, I wanted to explain how to prepare it. Substrate should consist of about 5 parts sand to 1 part coconut fiber; this most closely mimics nature & is the best for holding humidity & their tunnels. First, you will want to buy your supplies: sand & coconut fiber. 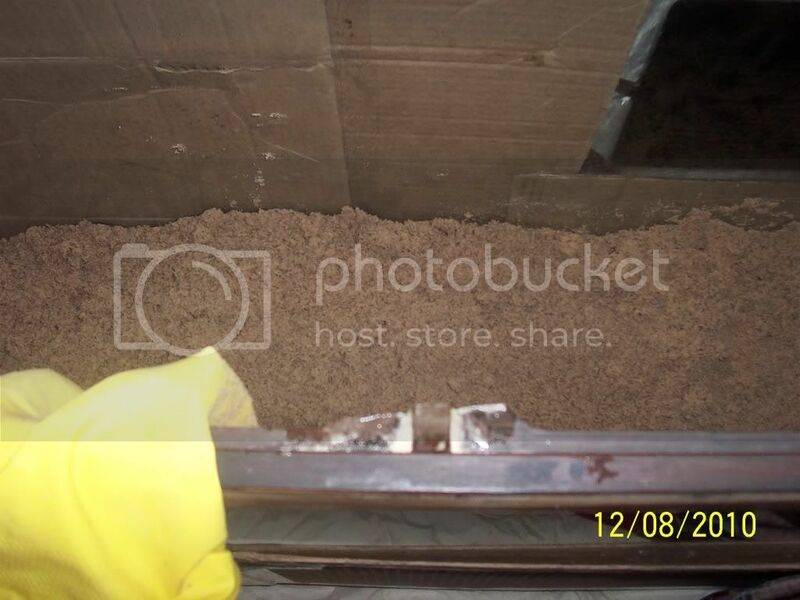 The most recommended sand is made by Quikrete for sandboxes. You can find it at hardware stores & places like Wal Mart or Big Al's (in Canada) and it is VERY cheap. You'll also want some cocofiber. 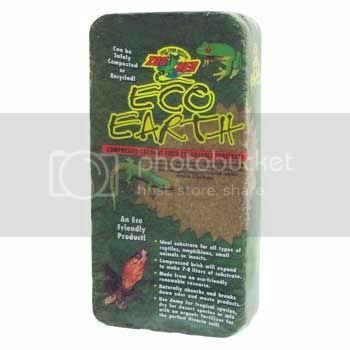 We recommend Eco Earth. You can buy it at pet stores or online & it is also very affordable. This is sold as a compressed brick you expand by adding water. The instructions on the package say: Place brick in a pail/bucket or sink. Add four quarts of water. Allow brick to expand for 20 - 30 minutes. Wring out excess moisture. 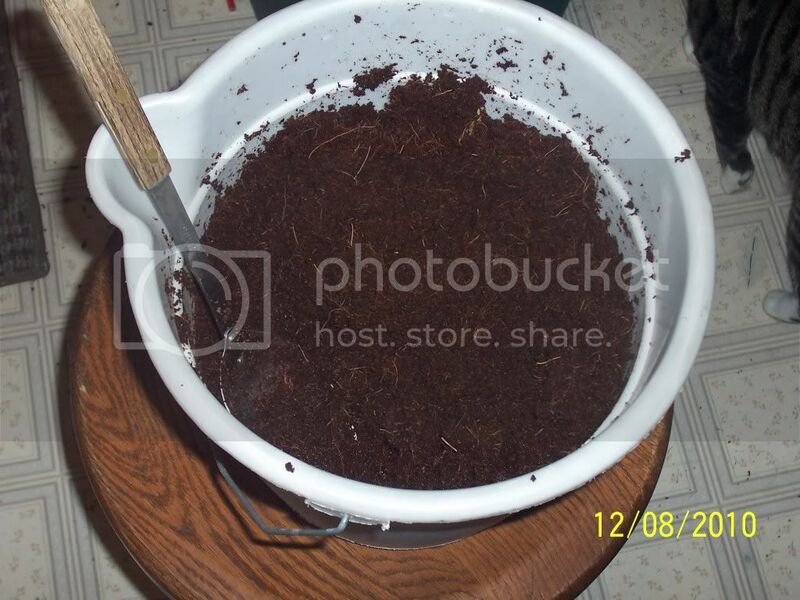 I put hot water in my bucket, about half to 2/3 full, then add the brick. 1 brick of EE makes approximately 15-20 pounds of substrate. In my experience, it takes longer than a half hour for it to expand though. As it starts to expand & soak up the water, break it up using your hands or a big spoon. When it's ready, it will look like a crumbled chocolate cake. You don't want to use the EE sopping wet, so you do want to wring it out and you could even use the water left in the bucket (if any) to mix into the sand later. Now comes the fun part. *I recommend enlisting help if you have a tank bigger than 10-20 gallons or have afflictions such as arthritis or carpal tunnel, as it will make your arms & hands tired mixing it all up. You want to mix the EE into your sand. I don't recommend adding more water until you have all your EE mixed in. The amount you will need for each is determined by how much sub you want as well as how big your tank is. Your substrate should be at least 3 times the height of your biggest crab. This means a 1 inch tall crab needs substrate 3 inches deep throughout the tank. When you have determined how much sand & EE you will need (see below), start mixing them together. Some people mix in a separate container & dump it into the tank as mixing in-tank can scratch your glass (not to mention the annoying noise, he he), but I mix in my tank. Poke your finger (or something like a spoon handle) down into your sub (preferably all the way to the bottom in several places to be sure it's consistent all over the tank). When you pull your finger out, you should leave a tube in the sub if it's the correct moisture level. If it doesn't collapse, crumble or fill in with water, it's perfect. If it crumbles, you need to add more water. Add only a little at a time, mix well & test it again. If it fills in with water, it's too wet & more sand should be added. These are approximate and greatly vary by tank size & desired depth. 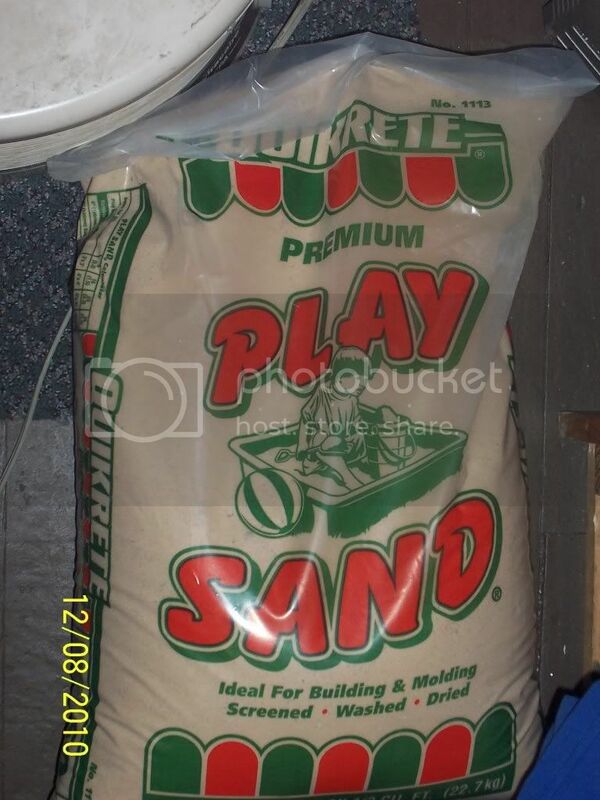 For one 50 pound bag of sand, you will use approximately half a brick of EE. In a 20 gallon (long) tank, using this formula would give you substrate over 6 inches deep. In my 55 gallon tank, I used 3 bags of sand and about 1 1/2 bricks of EE to get about 9 inches of substrate. *Note, over time, your substrate will settle so you may want to make it deeper when starting than you actually need it to be. The amount of settling depends on factors such as your crabs' activity and how much vibration the tank takes on a daily basis, ie; someone living right on a busy road will have sub that settles & compacts more quickly than someone who doesn't. *With properly made 5:1 sand/coconut fiber substrate, you never need to change it out unless you get bad mites or flooding; it breaks down waste & builds beneficial bacteria for your tank. I also have a tutorial series for setting up a crabitat; here is the substrate episode.